Waves crash as the Chickamauga Dam spills water on Friday, March 1, 2019, in Chattanooga, Tenn. The Tennessee Valley Authority's management of the Tennessee River during recent heavy rain has saved the region from significant flooding. Photo by Dave Flessner /Times Free Press. This story was updated Wednesday, March 20, 2019, at 8:18 p.m. with more information. The Chickamauga Lock, which had been shut down for most of the past five weeks, has reopened to barge traffic after managers of the Tennessee River reduced the flow going through the Chickamauga Lock this week. "We now have all of our locks open on all nine major dams on the Tennessee River," Lee Roberts, public affairs officer for the U.S. Army Corp of Engineers in Nashville, said Wednesday. The Chickamauga Lock construction may be delayed as high water appears to have flooded the major project just below the Chickamauga Dam, Thursday, Mar. 7, 2019. Chickamauga Lock has been shut down and barge traffic has been unable to travel through Chattanooga on the Tennesseee River for more than a month due to the heavy flow of water spilled through TVA's network of 49 dams after record rainfall in February followed the wettest year on record in the region during 2018. "We're thrilled that the Chick lock has finally got the flows below the threshhold so we can open the gorge [just west of Chattanooga] during daylight hours, but it's going to be a slow recovery to catch up with all of the shipments that have been delayed," said Cline Jones, executive director for the Tennessee River Valley Association, which represents barge operators that use the Tennessee and Cumberland rivers. 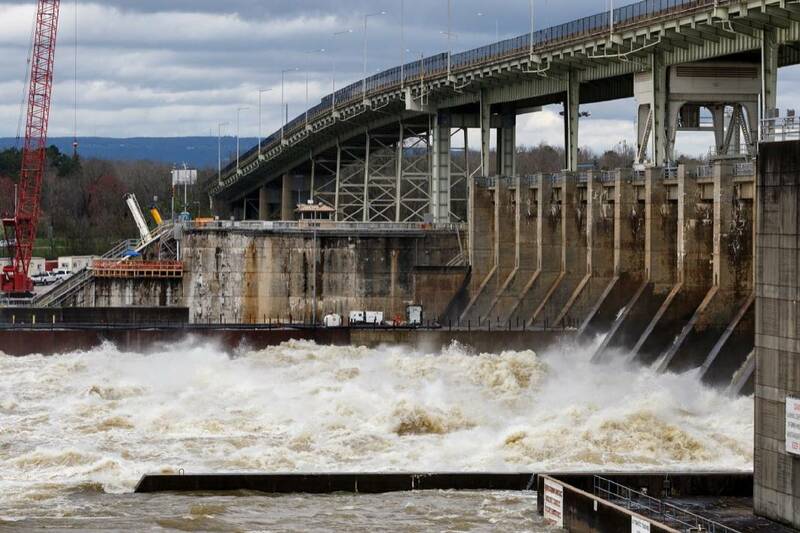 On Tuesday, TVA's river management center in Knoxville lowered the total water flow going though the hydro generators and spillways at the Chickamauga Dam below 100,000 cubic feet per second, or 740,000 gallons of water per second, TVA spokesman Scott Fielder said. The National Weather Service is forecasting clear skies and only limited chances of more precipitation in Chattanooga through Sunday. A portion of the dozens of barges rest against the shoreline across from downtown Chattanooga because high water continues to prevent river traffic. 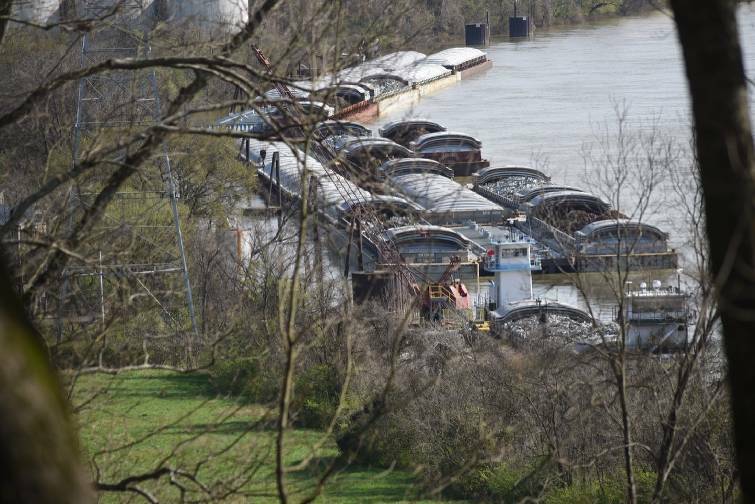 But even with the Tennessee and Cumberland rivers reopen for barge traffic, flooding on the Missouri River and problems in parts of the Tennessee-Tombigbee waterway will limit some river traffic coming in and going out of the Tennessee Valley, Jones said. "We've got challenges for months ahead," he said. The U.S. Army Corps of Engineers is replacing the existing lock at the Chickamauga Dam with a bigger lock to avoid ongoing problems with concrete growth in the wall chambers of the current lock and to provide the ability for barges to lock through multiple barges at a time to speed river navigation on the upper portion of the Tennessee River. But the construction work has been halted, and the coffer dam where the new lock will be built filled with water, due to the heavy rains.